The Double Tee represents the core of the precast parking system. East Texas Precast manufactures field topped double T’s that are typically dimensioned at 12’ by 60’ for a 36’ by 60’ bay, but can be adjusted to different sizes. East Texas Precast holds one of Texas’s largest Double Tee manufacturing facilities with 3 beds measure 560’ long by 12’ wide and another bed at 520’ long and 10’ wide. That’s almost 25,000 sq. ft. of Double Tee every day! Although Double Tees tend to be used most often in parking structures, there are numerous other such as roof members for industrial, gymnasium, manufacturing, and natatorium facilities where their long spans offer a column free space. Beams and columns, along with walls, form the core framing of the structure. East Texas Precast maintains one pre-stressed column and two pre-stressed beam forms. While all forms are adjustable to different length and sizes, multiple beam forms are helpful in maintaining efficiency when multiple beams from the same project are vastly different sizes. High quality engineering of these pieces ensures your structure is durable, structurally sound, and meet your code requirements. East Texas Precast can provide walls that have a variety of shapes and serve different functions. All wall systems will provide excellent blast, fire, wind, and seismic resistance, as that is one of precast concrete's natural strengths. Precast wall systems can be either load-bearing,or cladding, supported by the structural frame. Cladding is typically used to provide an aesthetic finish to a non-precast building frame. 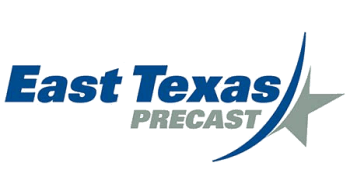 At East Texas Precast we can provide finishes that include: integral color, special aggregates, sandblasting, reveals, formliners, and thin brick. Finally, East Texas Precast can provide insulated wall panels. These panels are sandwiched between two thinner panels of precast and have an inner with a wythe of an insulating foam. The thickness of these panels will vary based upon the R-value that you need to achieve and the loads they resist. When precasters began manufacturing parking and other structures, one complaint was that not enough light was allowed to pass through the building. The ramp wall fixes that problem by creating an opening that light may pass through. These walls are typically on the interior of the building, and have metal piping cast into the openings to act as a pedestrian guardrail. At East Texas Precast, we often use spandrels to meet the open air requirements and resist automobile bumper loads for garages. They are finished to match both the walls and columns of a garage, or they can be given a separate finish to provide the garage with a unique look. Any finish that can be produced on walls can also be produced on the spandrels. East Texas Precast can manufacture stairs to fit any type of building.